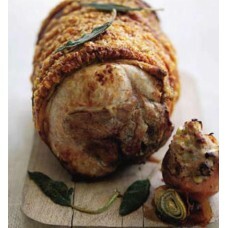 Roast leg of pork with sage and stuffed onions | Bonners of Ilminster "
Pre-heat oven to gas mark 4 or 180ÂºC, 450ÂºF. Weigh the joint and calculate the cooking time â 30 mins per 450g/1/2 kilo (1lb) plus 30 mins medium. Dry the rind and score deeply using a sharp knife. Brush with oil and sprinkle with salt. Place on a rack in a roasting tin and open roast in a pre-heated oven for the calculated time (no basting or covering or you will have soft crackling). Cut the onions in half horizontally (stalk to top) and using a spoon scoop out some of the layers, leaving 2-3 in the shell. Roughly chop the removed onion. In a pan heat butter and lightly fry onion. Remove from heat and allow to cool slightly. Add the sage and sausage meat and combine together. Take a handful of mixture and stuff in to onion shells. Prop up around the joint, drizzle with a little olive oil and cook for 40-50 minutes until onion is soft and fully golden. Serve with roast potatoes, parsnips, stuffed onions and crispy fried sage leaves.